From Moonbase Alpha: I was sad to hear that Martin Landau died overnight (London time). He had a long and distinguished career (including an Oscar for playing Bela Lugosi in ED WOOD) but, for Star Warriors, he'll always be remembered for SPACE: 1999. Not least because the moon was still bouncing around the ITV schedules well into the 1980s... followed by 1990s reruns on BRAVO and BBC TWO. The show's home video carrer was a little more complex. 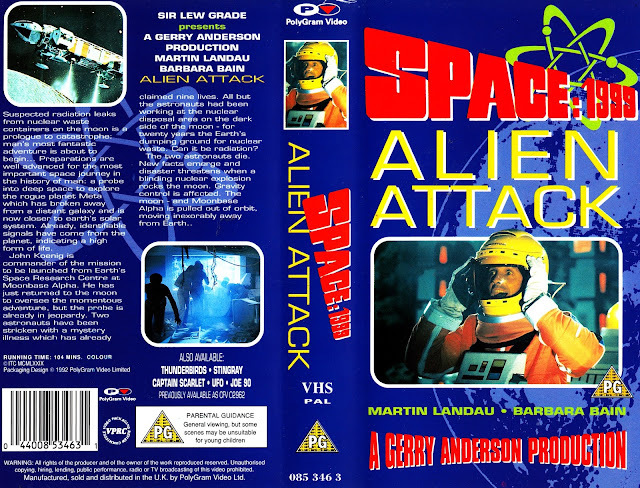 The early releases were restricted to cut-and-shunt multi-episode presentations created by ITC after the show itself. The 1990s saw the newly-launched ITC VIDEO add it to their roster... Although they initially had to skip the episodes already licensed elsewhere for the 'movie' versions. Which, naturally enough, included the all-important opening episode Breakaway. Polygram had inherited the rights to pump out the movies onto tape and this reissue - from the 1990s - was released alongside the ITC tapes. It contains Breakaway and War Games with - unusually - some additional sequences, with none of the original cast, set at the International Lunar Finance Commission. They are, understandably, quite busy after they misplace the moon. By co-incidence, Martin Landau is on the cover of the new issue of INFINITY. so many Saturday morning memories of SPACE:1999. The drum roll before he appeared in season 1. The Landau twirl in the chair from season 2. 1979: LAST ISSUE ALERT! TORNADO CRASHES. 1994: MARVEL BUYS MALIBU COMICS.